The new XR™ Li-Ion batteries with fuel gauge provide 33% more capacity over standard packs Compact, and the DeWalt brushless motor delivers up to 57% more run time over brushed. 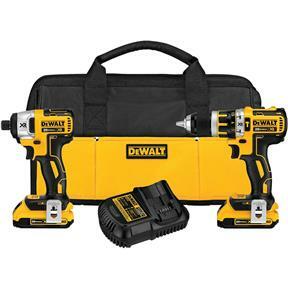 Combo kit includes the DCD795 20V MAX* 1/2" hammer drill and DCF886 20V MAX* 1/4" impact driver. Both have a compact (7.8" front to back and 5.6" front to back respectively), lightweight (3.6 lbs.) design that fits into tight areas. Both tools also feature LED lights with 20 second trigger release delay providing increased visibility in dark or confined spaces. 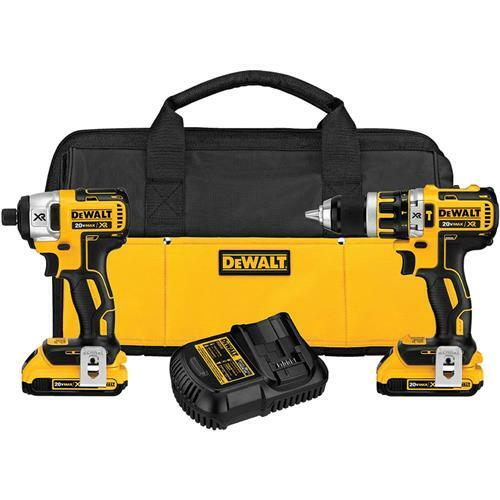 Also includes 2 20V Max* XR Compact Li-Ion Batteries (2.0Ah), Fast Charger, 2 belt hooks, 1 bit holder, and contractor bag.